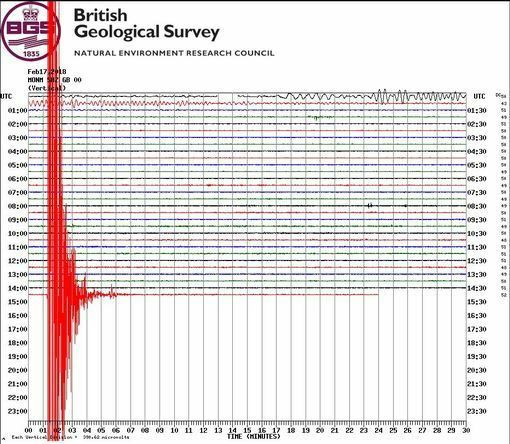 It has been a week of earthquakes in strange places, a magnitude 4.4 near the South Wales city of Swansea was the largest earthquake on mainland Britain in almost 10 years, since the magnitude 5.2 ML Market Rasen earthquake on 27 February 2008. According to BSG, a magnitude 5.2 ML earthquake in 1906 was one of the most damaging British earthquakes of the 20th Century, with damage to chimneys and walls reported from Kidwelly to Cardiff. On Valentines Day The United States Geological Survey reported a magnitude 2.0 earthquake was centred around Sanbornton, New Hampshire. A half-dozen other small earthquakes have rattled parts of New Hampshire and Maine over the past several weeks. While unusual to have so many this close together, small earthquakes are not uncommon across New England. In December 2017, a magnitude 4.1 on the Delaware coastline at a depth of 8 kilometres was the last "strange quake" to hit the US. On Monday, the mid-Atlantic Azores Islands experienced hundreds of small earthquakes on Monday, the Azores Center for Seismovolcanic Information and Surveillance (CIVISA) confirmed. The tremors began shortly before midnight on Sunday and continued throughout Monday morning. Most were microseisms, tremors caused by a natural phenomenon that cannot be felt by humans.